The Tokyo Metropolitan Institute of Medical Science （TMiMS） began its operations in April 2011 as a brand new institute integrating the formerly independently operated three institutes; the Tokyo Metropolitan Institute for Neuroscience, Tokyo Metropolitan Institute of Psychiatry, and Tokyo Metropolitan Institute of Medical Science. Furthermore, on April 1, 2012, the institute was certified as a Public Interest Incorporated Foundation by the Governor of Tokyo. Our institute aims to improve the medical treatment and welfare of citizens in Tokyo through comprehensive and integrative approaches to medical problems the big city is facing. 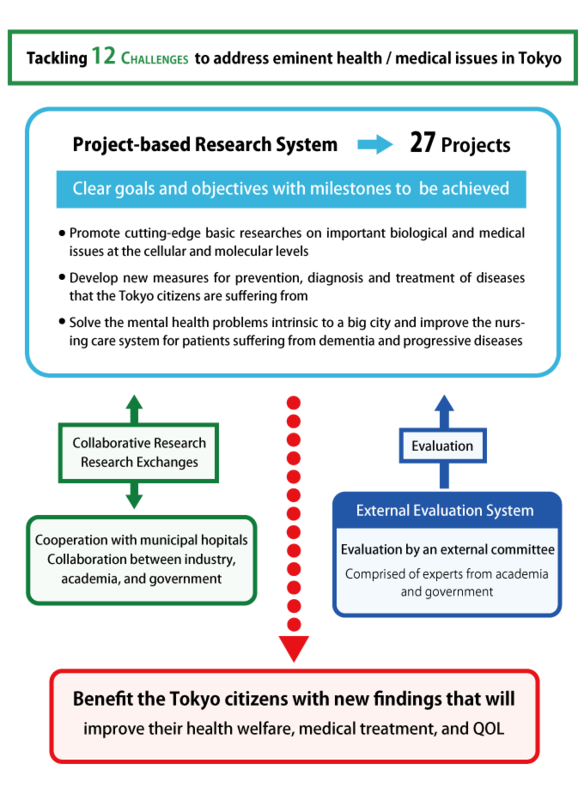 We attempt to achieve the goals listed in the “Tokyo in Ten Years” plan which includes such projects as development of diagnostic methods for early detection and assessment of cancer, improvement of the health care measures for elderly people and patients with incurable diseases, and accelerated clinical application of research results. We will collaborate with municipal hospitals to develop new and better diagnostic methods and also new drugs and therapeutic strategies. The brochure below offers more detailed information about our institute. The Tokyo Metropolitan Institute of Medical Science (Public Interest Incorporated Foundation) conducts its research activities mostly through “Project-based Research System” aiming to address and solve the subjects listed below. Tokyo Metropolitan Institute of Medical Science implements a series of project researches focusing on the issues listed below. Project research system aims to promote effective and efficient research with a clear goal of improving public health and medical welfare of the Tokyo citizens. Each project is planned with clear research objective and time schedule, and the research progress is regularly evaluated by external committees.